There are plenty of ways for UNCG students to get involved on campus – 231 to be exact. 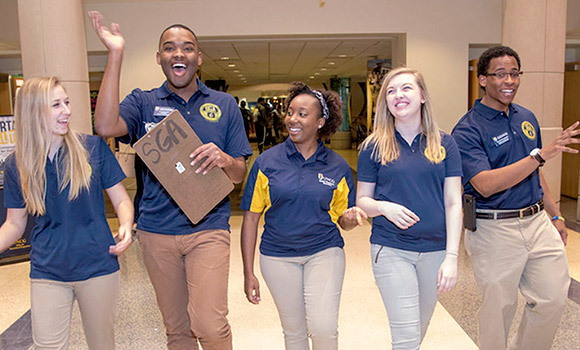 Whether students are interested in academic, professional, governing, social or religious organizations, there are many options for UNCG students looking to connect and get involved, from The National Society of Collegiate Scholars to Cru to The Spartones. As UNCG students continue to take ownership of their college experience, the number of student organizations is constantly growing. Students who wish to establish new student organizations have the opportunity to do so with the help of CAP. Freshmen Linda Cheng and Russell Fabito are currently working with Lail and several others to establish a new student group called Sustainable Development of Eastern Countries (SDEC). Their goal is to provide humanitarian aid to developing countries such as Syria. In addition to student groups, CAP is home to the Activities and Campus Events (ACE) office, which hosts events for students that speak to every aspect of campus life. There’s an event on campus almost every day, and most events are free with a UNCG student ID. Looking for ways to connect with your interests and others on campus? Visit UNCG’s CAP website for a full listing of student groups, details on starting a new student organization and a calendar of ACE events. Students interested in Greek life can also visit the fraternity and sorority life website or email Curtis Tarver in the CAP office at cwtarver@uncg.edu.